The English do picnics so well, a properly laid table, a table cloth, crockery and cutlery, no paper plates thank you! This oh so very English affair actually is of French origin. The earliest reference found in French text in the 1700's where a "piquenique" was actually a BYO restaurant. However it was in the 19th century that English society embraced the concept of outdoor dining turning it into a luxurious affair, a grand occasion of sumptuously laid tables set in meadows. Foods prepared by chefs usually consisting of pastries, hams and baked meats, with servants attending to the diners every needs. 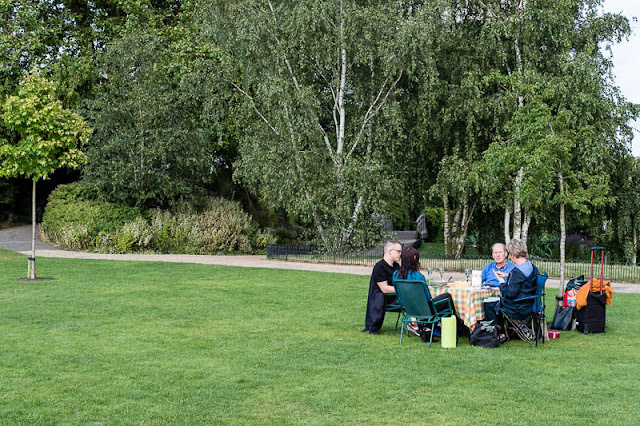 Unlike wealth the concept of a more formal way of outdoor eating did trickle down to the masses and thus the traditional English picnic entered their culture. I haven't been on a true picnic for years. I've eaten at sidewalk cafes plenty of times but, it's been a very long time since I've been to a real picnic. I might have to arrange one this fall after it cools down a bit. It's been a long time since I've had one of those. Picnics are fun and these people look like they're enjoying it. I always associate those kind of picnics with the French, down to the table napkins. Most of my experience of picnics has been sprawling around with the kids treading in the food. Still maybe that's just me. You can't beat a great picnic ... especially when the grand-children come too!